We are told that Canada's weather will be OK while Antarctica will heat up by 5 °C and the West Antarctic ice sheet will collapse, raising the sea level at least by four meters. Meanwhile, most of North Africa will be desertified, and so on. And all these things will occur due to CO2 emissions. Needless to say, these statements are completely preposterous from a scientific viewpoint. What will actually happen with the global averages? First of all, the CO2 emissions will converge towards zero sometime between 2030 and 2200 because the fossil fuels will (have to) be replaced by other sources of energy: they will get depleted as some point. (Replacements are known already today - they're just uneconomic at the present.) I really don't know the exact year and I don't think it's important for any purpose to speculate about this year. As we will explain in quite some detail, by the year 3000, the CO2 concentration will return towards the value dictated by the external temperature. The Antarctice ice core data show very clearly that this is what CO2 does, after a 800-year lag (plus minus 600 years). The reason has been discussed almost infinitely many times. 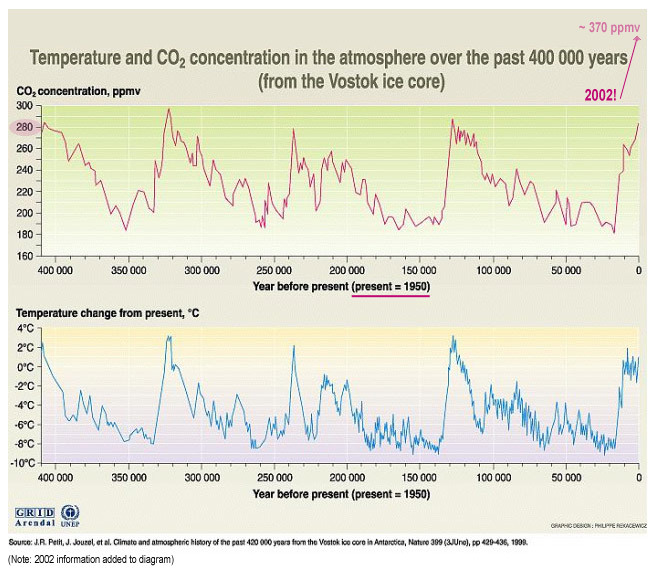 The graphs from the last 400,000-600,000 years show a very tight correlation between CO2 and temperature. However, a closer scrutiny reveals that the CO2 changes are lagging behind the temperature changes by 800 years in average. We also know why it is so. The relevant layers of the ocean are able to emit/absorb the gases - including CO2 and methan - to/from the atmosphere. However, it takes time for these layers of the ocean to adjust their temperature to the atmosphere around them. After 800 years or so, they do so and emit/absorb the right amount of the trace gases to/from the atmosphere so that the concentration agrees with the temperature. Because of the human activity, there will be something like 600-1000 ppm of CO2 at the peak level. However, the CO2 concentration that can be in natural equilibrium with the temperature at that moment is about 300-320 ppm because the greenhouse warming from doubling or quadrupling CO2 relatively to the pre-industrial levels will be just between 2 and 4 °C and the graphs above show that this warming is equivalent to the CO2 increase by 20-40 ppm, it's clear from the historical record that within 800 years, the CO2 concentration will return from 600-1000 ppm to 300 ppm in at most 800 years. Once it happens, the greenhouse effect of the disappeared CO2 will be undone, too. The time 800 years above is actually likely to be a significant overestimate; CO2 will return close to the pre-industrial levels much more quickly than that. Why? Many people still don't understand the positive and negative contributions to CO2 in the atmosphere, so let's review a few basic facts again. So we annually emit 29/3,160 = 0.92 percent of the existing CO2 in the atmosphere. The concentration should therefore increase by 0.0092 * 388 ppm = 3.56 ppm every year. In reality, it only increases by 1.86 ppm or so: we can measure how quickly the CO2 is actually increasing every year (the Keeling curve). It follows that the difference between Nature's absorption and emission must be approximately 1.7 ppm every year. Nature prefers to absorb CO2. What many people don't understand is that this "excess of natural CO2 sinks over the CO2 sources" would continue even if we immediately stopped all CO2 emissions next week. Nature doesn't try to balance a fixed portion of our emissions during the last financial year or something like that which is what some people apparently and nonsensically believe; instead, the figure 1.7 ppm or so only depends on the concentration that is already "out there". Why? It's because this excess of sinks exists because the CO2 is elevated above the equilibrium dictated by the current global mean temperature - which is about 290 ppm. Just look at the graph above. Carbon dioxide sinks cannot measure which CO2 molecule is anthropogenic and which CO2 molecule was emitted during the last year: they are only sensitive to the CO2 concentration around them and this is what influences their absorption rate. How much the humans have emitted during the last year is totally irrelevant for the CO2 sinks. That's why the idea that the "airborne fraction" would remain fixed even if the industrial CO2 emissions rapidly changed is absurd: what is nearly fixed is the total absorption (minus emission) by Nature - 1.7 ppm per year or so. We're just less than a Celsius degree above the pre-industrial global mean temperature whose equilibrium CO2 concentration was 280 ppm - and you need about 10 °C of warming to naturally change CO2 by 100 ppm (see the ice core data for the glaciation cycles). So 1 °C of warming can only raise the equilibrium CO2 concentration by 10 ppm or so. Because the actual concentration is substantially above 290 ppm today - because of our direct emissions - it follows that the natural processes that consume or absorb CO2 are strengthened, and those that produce or emit CO2 are weakened. This imbalance can be quantified and we have already mentioned what the empirically measured overall result is: aside from the sinks that match the sources, Nature absorbs additional 1.7 ppm from the atmosphere every year. Because the CO2 concentration is 390 ppm instead of 290 ppm, i.e. we're 100 ppm above the equilibrium value, Nature absorbs 1.7 ppm a year. You should realize that there is an approximate proportionality law between this 100 ppm excess and those 1.7 ppm sinks. If we were at 490 ppm i.e. 200 ppm above the equilibrium concentration, Nature would absorb about 3.4 ppm a year, and so on. Needless to say, the decrease would be even more dramatic if the emissions suddenly stopped at a much higher CO2 concentration. Imagine it's the year 2150 and the CO2 concentration is 1,000 ppm - which is not dangerous in any way (some people only start to get dizzy at 5,000 ppm). The temperature from the two CO2 doublings will be about 1-3 °C higher than in the pre-industrial era because of the greenhouse effect. But even if you imagined 5 °C, it wouldn't make much difference. This temperature would predict the equilibrium CO2 concentration to be just 280 ppm + 10-30 ppm - between 290 and 310 ppm (or slightly higher for the unrealistic 5 °C warming). But 1000 ppm is about 700 ppm above this value - so Nature will actually be likely to absorb 7 times 1.7 ppm a year, a whopping 12 ppm a year. In less than two centuries, the CO2 concentration will return to numbers well below 350 ppm or so even if you begin at 1,000 ppm. The actual observed lag - 800 years - is longer than the time needed to adjust the CO2 concentrations by the mechanism above because those 800 years is dominated by the time needed for the oceans to heat up or cool down - which is a slower process than the process we considered now - the ability of the oceans and the biosphere to absorb the excess CO2. The lag observed in the ice core data is the greater number among these two, or a sum of them. However, during the glaciation cycles, the external drivers were primarily changing the temperature and the CO2 followed the temperature after the oceans heated up or cooled down; in the industrial era, the external drivers - us - primarily change the CO2 concentration but the CO2 concentration still follows the temperature but the necessary process - the natural absorption of excess CO2 - is faster than the heating up and cooling down of the oceans. 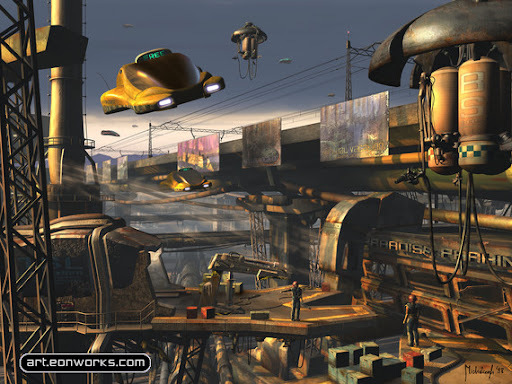 At any rate, in the year 3000, the atmosphere will clearly experience no impact of our temporary, multi-centennial usage of fossil fuels at all. However, it doesn't mean that the climate at all continents will be the same as it is today. The climate is always changing but in the long run, surely at the time scale of a millennium, this fact doesn't depend on the humans or anthropomorphic gods in any way. Most of the important changes of the climate will be local, of course. The very concept of a global climate is a deep misunderstanding of science.